A Comprehensive Britain Coach Tour – This elegant tour of Scotland and England evokes a bygone age; discover traditional villages, stately homes, historic castles and beautiful gardens. Enjoy a leisurely touring pace with two-night stays in each overnight destination. Enjoying expertly planned day excursions or city tours from your accommodation bases, not to mention a fabulous array of local visits designed to showcase each region in depth. A truly engaging and well balanced itinerary of Britain. This morning, arrive in to Scotland, the land of legends and romance, famed for the cultural cities of the South and dramatic mountains and misty lochs of the Highlands, this country never fails to deliver jaw-dropping monuments vistas. Complimentary transfers are available for those arriving in to Edinburgh Airport this morning – please ask for further details. After checking-in at your centrally located hotel, the rest of your first day is yours to relax or begin exploring Edinburgh before meeting your Travel Director and fellow travel companions at 17:30 for a Welcome Dinner. 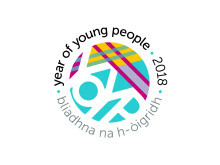 Enjoy this first opportunity to get to know each other over food and drink ahead of our first day exploring Scotland. On the first day of our tour together we join up with a local expert, a resident of Edinburgh, to see the highlights of the city. Sit back and relax as we drive along the central hub of Edinburgh, Princes Street to the ornate Scott Memorial. Pass the elegant 18th Century New Town, famed for its neoclassical Adam facades and the medieval the Old Town. 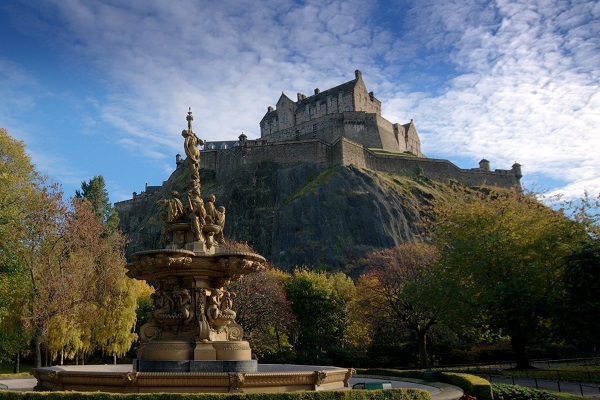 Here we enjoy a visit to the stunning Edinburgh Castle, perched high over the city; see the Stone of Destiny and Scotland’s Crown Jewels, commonly referred to as The Honours of Scotland. The afternoon is yours free to explore the city; perhaps a visit to the National Gallery and the art treasures inside? On selected departures throughout August, you will also attend the Military Tattoo, a spectacularly colourful mix of pipes and drums, dance and display, beautifully set against the backdrop of the Castle. Departing the Scottish capital, we continue our adventure together with a visit to Ardgowan, beautifully set among a 10,000-acre coastal estate along Scotland’s dramatic Western county of North Ayrshire. Here, meet Sir Ludovic Shaw Stewart for a fantastic tour of the expansive house, taking in the histories of the area, from the family, the domain, and perhaps most importantly, the famous ghost! Afterwards, delight in freshly-made, traditional Scottish Tea and Scones. Moving on, we visit world-famous Gretna Green to see the famous spot where runaway lovers from England crossed the border to Scotland to marry over the anvil in the blacksmith’s shop. Leaving Scotland behind us, we continue to the picture-perfect region of the English Lake District. Arriving at the hotel, dinner is served. Today we devote the day to the picturesque landscapes of the Lake District, famed for its rugged mountains and tranquil waters. As a result of its natural beauty, the area has become synonymous with English poetry, art and literature, providing the perfect inspiration for many famous works. First, we visit William Wordsworth’s grave at St Oswald’s Church in Grasmere, a traditional Cumbrian lake-land. Next, we get a true Lake District experience with a relaxing cruise on Lake Windermere for magnificent views of the secluded bays and wooded islands. Finally, we embark on a traditional steam train, travelling along the banks of the stunning River Leven. Enjoy a morning of leisure today in Bowness-on-Windermere a charming Cumbrian village before meeting up with the group to continue our journey. Today we pass South, travelling across the Yorkshire Dales to arrive into the quintessentially English village of Haworth. Here, we visit the Brontë Parsonage Museum, family home of the famous literary sisters whose works were inspired by the surrounding Yorkshrie Dales and Moors. In the evening, you are treated to a private tour of Birdsall House the family home of the Willoughbys since 1719. Enjoy a glass of sparkling wine and canapes as you learn about the estate and admire the incredible collections of art and furniture, acquired by the family over the last 700 years. You then take your seats in the stately dining room as you join one of the family members for your Home-Hosted dinner. Waking up in York, we spend today exploring one of Britain’s most historic and popular cities, known for its exquisite architecture and its links to the Vikings, who controlled the city during the ninth and tenth centuries. Stroll through the town with a local expert to see the impressive walls and the towering York Minster, the largest gothic cathedral in Northern Europe. 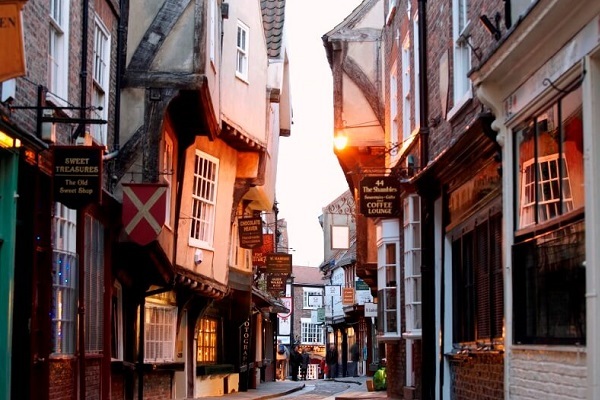 Next, we walk to the Shambles, a quaint, narrow, cobbled street where the rickety buildings lean over the lane below; home to a host of with traditional shops this is reputedly England’s first shopping street. By afternoon, there will be plenty of time to further explore York independently; perhaps visit the National Railway Museum or continue picking up those souvenirs. Today, we continue our journey South, making our first stop at the city of Lincoln, known for its stunning medieval cathedral. Here, we visit one of the finest Norman castles in England. The castle also houses a Victorian prison and one of the few remaining copies of the Magna Carta. Moving on from Lincoln, we travel to our next overnight stay in Stratford-upon-Avon home beautifully set on the banks of the river Avon. 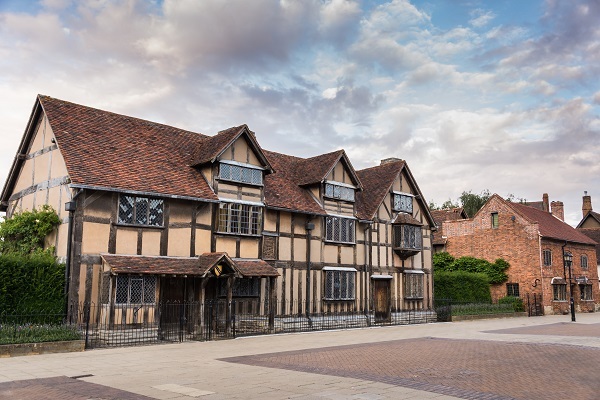 Your hotel is located within its own private grounds just a short walk along the River Avon to the Royal Shakespeare Theatre and the town centre famous for its wealth of black and white timber-framed buildings, synonymous with Tudor Britain. After a relaxed start, we re-group to discover how Shakespeare and his incredible, timeless works continue to delight audiences today. We walk the short distance to his birthplace, full to the brim with interesting historical artefacts and memorabilia relating to the great playwright. Come the afternoon, enjoy free time to explore further this great town; perhaps take a ride along the River Avon, or take local transport to Anne Hathaway’s Cottage. In the evening, join your Travel Director for the highlight of the stay in Stratford-upon-Avon, a feast of a traditional Sunday Roast Dinner, served with fluffy Yorkshire puddings and complete with all the trimmings. This morning we depart for a truly enchanting day, travelling across beautiful, rolling Cotswolds hills, and through picture-perfect chocolate-box villages of golden stone cottages with thatched rooves. Our first stop of the day is the magnificent and grandiose Blenheim Palace, the ancestral home and birthplace of the “Greatest Ever Briton”, Winston Churchill. Explore the house and gardens before we continue to the elegant Georgian town of Bath in the farming county of Somerset. The town, once a haven for the Romans, was built in amphitheatre-style on the surrounding hills. Upon arrival, your Travel Director introduces you to the impressive residence of the Royal Crescent and Pulteney Bridge, both built with the same mellow local stone found across the town. The town of Bath, a UNESCO World Heritage Site built on Britain’s only geothermal, mineral springs and the highlight of the stay here is unquestionably a visit to the Roman Baths. Inside the Baths, view the incredibly well-preserved remains of one of the greatest spas of the ancient world from above before stepping inside to the extensive exhibit and information centre to study the ancient history of the Baths. With the afternoon at leisure, we recommend a visit to the nearby Thermae Spa for a relaxing soak. Alternatively, explore this charming town including historic Abbey, the Royal Crescent or visit the Jane Austin Centre to follow in the footsteps of the great author. In the evening, join your Travel Director and fellow travellers to think back over your wonderful journey together over dinner and wine. 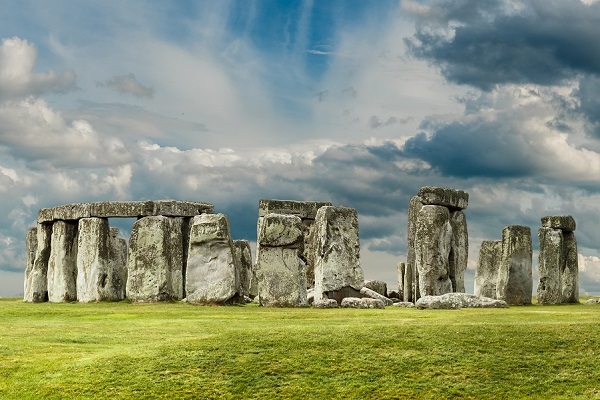 On our final day, we depart Bath and travel across the mysterious Salisbury Plain to possibly Britain’s most iconic attraction, the pre-historic standing stones of Stonehenge. Here we view the monoliths themselves, wandering around the awe-inspiring stone circle before visiting the new interactive visitor centre. Later, we continue East to London, the magnificent capital of England, where our journey together ends at Marble Arch in the heart of the city. From here you can make onward travel within London or the South of England or let us know and we can add extra post-tour nights in London and onward rail travel back to Edinburgh if required. Meet Sir Ludovic Shaw Stewart for a tour of the expansive Ardgowan Estate, with Scottish Tea and Scones. Enjoy a private tour and dining at Birdsall House in Yorkshire. 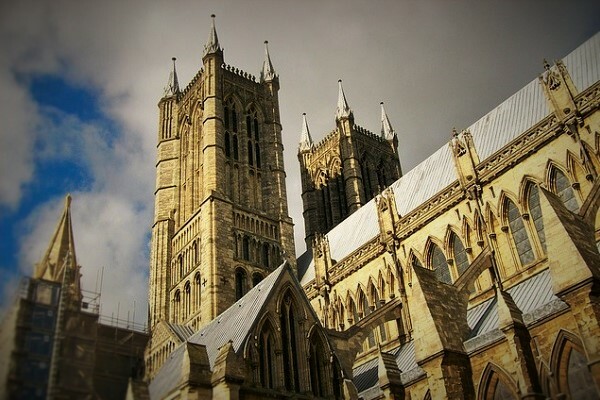 See Lincoln Cathedral and an original copy of the Magna Carta. Explore the priceless art and tapestries of the Baroque masterpiece at Blenheim Palace. Relax in the scenic Lake District with a lake cruise and steam train ride. For a limited time in August, you are witness to the breathtaking spectacle of the Edinburgh Military Tattoo (selected departures). 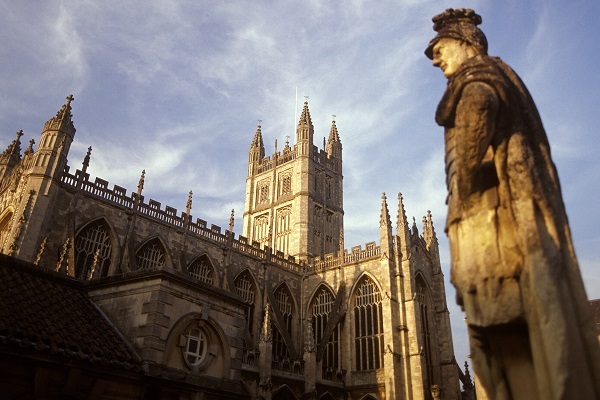 Explore the ancient Roman Baths in Bath. Visit the mysterious stone circle of Stonehenge. 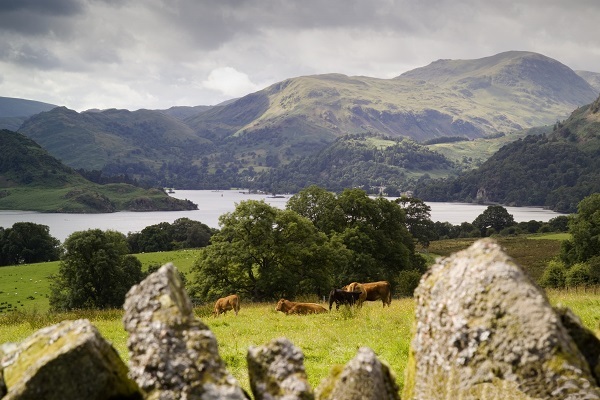 Learn about the life of poet William Wordsworth in the Lake District. See Holyroodhouse Palace and the 18th century ‘New Town’ of Edinburgh. See York Minster, city walls and medieval “Shambles”. Scenic drives: Cotswolds, the Yorkshire Dales and Lake District. Bowness-on-Windermere: Nestled on the shore of England's largest lake, experience traditional country house charm at The Old England Hotel. Enjoy the unique comfort of luxury air-conditioned 40 seat coach with extended leg room and on-board restroom. 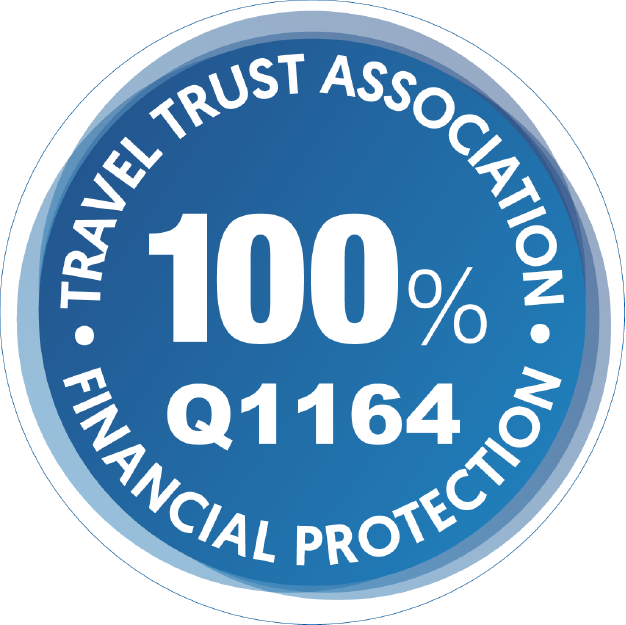 Complimentary WiFi in the majority of hotels either in the lobby or bedroom areas and available on most touring coaches (subject to signal). 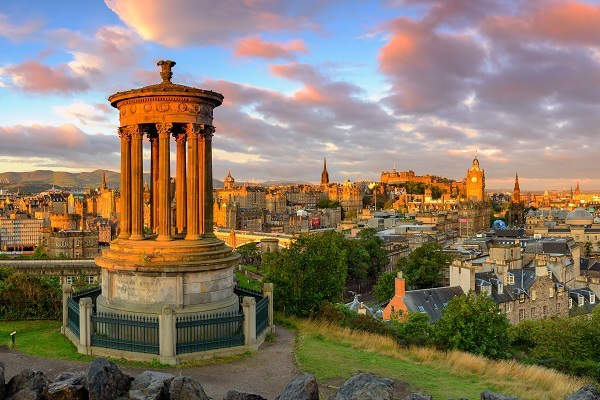 Rail travel to Edinburgh from London or other UK destinations before your tour. Additional nights in London after your tour has concluded. Onward rail travel back to Edinburgh if required. This tour starts early evening (around 5:30pm) on the first day of travel and ends around 6.30pm on the final day of the trip.